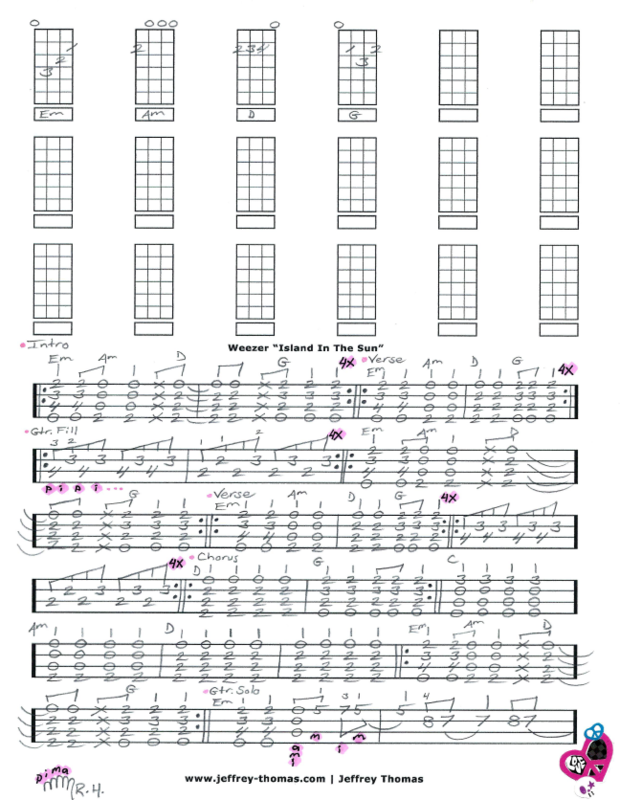 Weezer Island In The Sun Free Ukulele Tab by Jeffrey Thomas. This is a really fun song to play on the ukulele and my free ukulele tab arrangement includes the proper chords, song structure and even the guitar solo! Lead the jam with my accurate version that follows the studio recording. Want the full ukulele tab for free? Just send in your email address through the form and I’ll send it to you. Looking to improve your ukulele playing? Fill out the Schedule A Free Lesson form to set up your free Skype ukulele lesson today! “Island In The Sun” is Weezer’s biggest hit ever outside the U.S. reaching #7 on Australia’s charts. Find more cool, unique free online ukulele tabs on my tab, video and blog pages.